President John Dramani Mahama has predicted a tough election 2016 but has admonished supporters of the National Democratic Congress (NDC) to fix their eyes on the ball. He is optimistic “victory” is in sight for the ruling party come December 7, but it will take every hand on deck to secure that triumph. 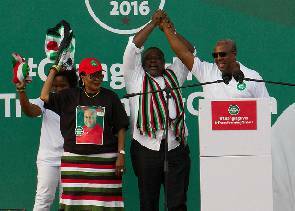 “Don’t be distracted and we have a good track record,” Mahama, who is the 2016 presidential candidate of the NDC told a teeming crowd at Cape Coast during the launch of the party’s campaign. “My first term as president has been challenging but also very positive. It began with the election case in court where many Ghanaians sat and followed through with process because it was televised and the international community also been slow with the necessary support because of the uncertainty which surrounding the outcome,” the President stated.